Fatima Imni is one of the first young women from Tansghart village who learned to knit with Eve. Until the age of 12, Fatima attended the local primary school in the village. Unfortunately, she could not continue her schooling because the secondary school was one and a half hour’s walk from her village. Fatima loved Eve’s passion to teach the local girls new skills, and soon more than 30 girls began gathering regularly to learn to knit. This led to the creation of the first craft centre. Fatima successfully completed a tailoring programme in Tansghart craft centre and became an assistant to the resident teacher, Rachid. 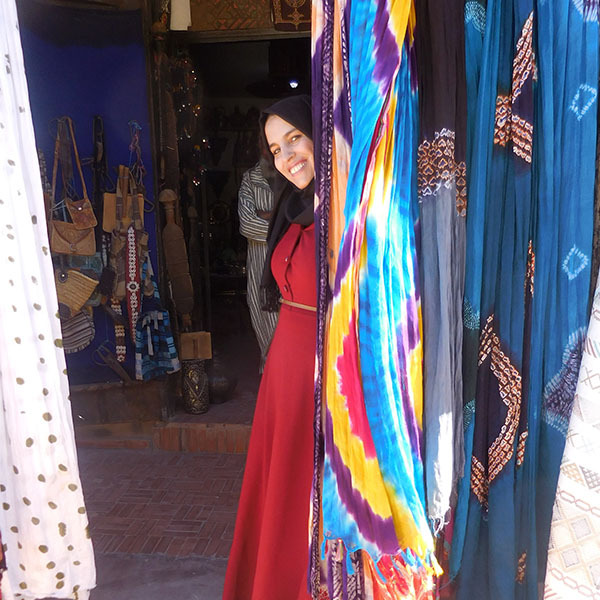 She also received retail training at the boutique at Kasbah Tamadot. Now 27-years-old, Fatima supervises the Eve Branson Foundation Shop located next to the Berber Boutique, responsible for displaying and selling items made in the crafthouses by her peers. She enjoys talking to guests and taking on new responsibilities – all the while continuing to make and sell her own products. Since taking on the role at the shop, sales and income have increased for her peers.